As we have noted there are many dimensions to quality and challenges to providing the quality services which are required in order to reduce maternal and neonatal mortality. This resource package is focused on a systems oriented approach to providing and improving quality services across the continuum of care. Within this there are many stakeholders with different roles and responsibilities towards ensuring quality. However, in Maternal and Newborn Health (MNH), the person who provides care to pregnant women and newborns has been a focus in considerations of service quality. This has led to the concept of the ‘skilled birth attendant’ (SBA) also known as a skilled attendant. WHO consider SBAs as the ‘single most important factor in preventing maternal deaths’ (WHO 1999). A high level of emphasis has been placed on the role of the SBA; the proportion of deliveries assisted by an SBA has been used as an MDG an indicator for measuring maternal mortality reduction. In 2004 the WHO, the International Confederation of Midwives (ICM) and the International Federation of Gynaecology and Obstetrics (FIGO) issued a joint statement which defined an SBA as ‘an accredited health professional – such as a midwife, doctor or nurse – who has been educated and trained to proficiency in the skills needed to manage normal (uncomplicated) pregnancies, childbirth and the immediate postnatal period, and in the identification, management and referral of complications in women and newborns’ (WHO, ICM and FIGO 2004). The statement also listed over 20 core functions that all SBAs must be able to perform. It also recognises the need for SBAs working in remote areas to have additional clinincal skills to manage more complicated deliveries and incomplete abortions. The statement also calls for selected SBAs to be trained to in emergency care and to be placed in referral centres. This Series (Renfrew et al, 2104) provided a framework for quality maternal and newborn care (QMNC) that firmly places the needs of women and their newborn infants at its centre. It is based on a definition of midwifery that takes account of skills, attitudes and behaviours rather than specific professional roles. The findings support a shift from fragmented maternal and newborn care provision that is focussed on identification and treatment of pathology to a whole-system approach that provides skilled care for all. For more see the videos in Section C.
There is generally a lack of a standardised definition at country level and often an assumption that a nurse or doctor qualifies as an SBA even where they have not undertaken the specific training or are unable to deliver all of the core functions. In some instances other cadres health workers may be classified, formally or informally, as an SBA as a reflection of the fact that they perform deliveries rather than on the basis of qualification. This lack of clarity is often the result of no, or poorly understood and/or enforced policy and training. Some implications of this lack of standardisation may include inappropriate care being delivered by inappropriately trained health workers and a lack of clarity on roles and responsibilities which can compromise the effectiveness of the SBA approach. A recent study in nine countries in Sub-Saharan Africa found a lack of standardisation of titles, training and functions performed by SBAs. In many instances there is also a lack of clarity regarding procedures specific cadres, classified as SBAs, are legislated to or allowed to perform. This can result in doctors often performing the more complex procedures regardless of whether or not they have received specific training (Adegoke et al 2012), A study across four Asian countries found that many aspects of emergency obstetric care are often provided by medical doctors only even where SBAs have been trained to provide these services (Utz et al 2013). Both studies call for appropriate training and legislation. The assumption that more highly qualified health workers will provide a better quality of MNH care has been challenged by some studies. One recent review of the quality of care provided by mid-level health workers revealed no difference between the effectiveness of care provided by mid-level health workers and that provided by higher level health workers, although the quality of the evidence was noted to be low (see Lassi et al 2013). An assessment of the skills and knowledge of a range of health workers and medical students in four countries found very little difference in the overall skills and knowledge of the different cadres; with some specific exceptions (Harvey et al 2007). The definition of a SBA is limited to the management of ‘normal (uncomplicated)’ pregnancies, childbirth and the immediate postnatal period, with the assumption that complications will be identified, managed and referred to a centre where EmONC services are available. Health centres and hospitals that have performed the signal functions 1-7 (see figure 2.7 below) within the past three months can qualify for Basic EmONC (BEmONC) status. If a facility has performed signal functions 8-9 in this time period it qualifies for Comprehensive EmONC (CEmONC) status. The vast majority of maternal deaths are the result of a complication: it is in the successful management of these cases where the highest impact on mortality rates can be made. Therefore effective referral systems and high quality EmONC is essential. Training SBAs in basic EmONC (BEmONC), including neonatal resuscitation, has the potential to reduce the necessity, and uncertainty, of referring all complications. A skilled birth attendant relies on an enabling environment and various components of the health system in order to deliver skilled care. The following diagram summarises the key elements of successful skilled care at birth. The diagram highlights the importance of an enabling environment with appropriate regulatory frameworks and policies and an effective health system that ensures access to supplies, adequately equipped facilities and a robust referral system. An enabling environment will also ensure that adequate support and supervision is in place to maintain motivation and to address supervised to ensure that they are motivated. 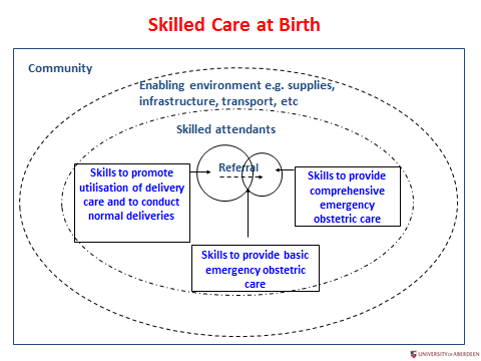 In addition to the clinical skills the diagram also recognises the need for skills in promoting the uptake of skilled attendance at births. Like many health interventions the uptake of services can be challenging. Studies have identified economic and social costs, distance and health worker attitudes as barriers to the use of SBAs (see for example Bazzano et al. 2008, Choulagai et al. 2013 and Mayhew et al 2008). This is well illustrated in the description of skilled care at birth. A skilled attendant relies on an enabling environment and various components of the health system in order to deliver skilled care. Even ‘skilled care’ (provider plus enabling environment) is only one element of quality. Other aspects, such as staff motivation, attitude or acceptability of services to the user, are not immediately obvious from the diagram (Figure 2.8, Hussein et al 2004), but will be highlighted elsewhere. Sources: Hussein J, Bell J, Nazzar A, Abbey M, Adjei S and Graham WJ (2004). Measuring the impact of SBA on mortality rates remains a challenge. The main focus of monitoring is on the presence of the SBA, not on their skills or the enabling environment. There are some specific studies that show positive results but the evidence base is limited. There is an apparent association between maternal mortality rates and an increased proportion of births being attended by an SBA although this may not be the only, or even most significant, cause for the decrease. There is no standard framework for monitoring and evaluation the impact of SBAs (see Adegoke and van den Broek 2009). Check your knowledge: Why is the presence of a skilled attendant not sufficient for a quality service to be provided? Assuring good quality services requires more than a skilled health attendant. Even if the person has all the skills necessary to provide all the essential services for a pregnant mother and the newborn, they will need support and an enabling environment. This means a functioning health system enabling the SBA to provide an effective Continuum of Care and quality services for mothers and new borns.The percetnage of women attending 4 antenatal visits is therefore not a good outcome indicator.